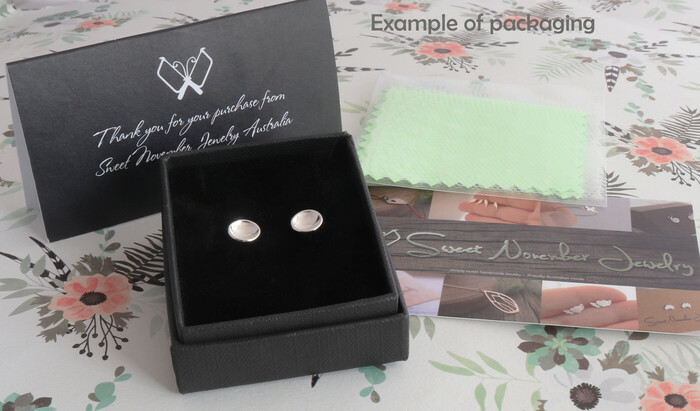 Quirky little mismatched apple studs, handmade using quality Australian sterling silver materials only. These delicious little studs will add a cute and quirky pop to your outfit. They are suitable for day to day wear, and are suitable for people with sensitive ears, as they contain no nickle, only 925 sterling silver. They make a unique gift for a teacher. Each stud is hand cut from sterling silver sheet one at a time, sanded, and then soldered to a 10 mm long and 0.8 mm thick sterling silver ear post. They are polished and tumbled for a lovely shiny finish. The full apple stud measures 5 mm width and 7 mm height, and the apple core measures 4 mm width and 7 mm height, so they are small enough to wear in a second piercing.